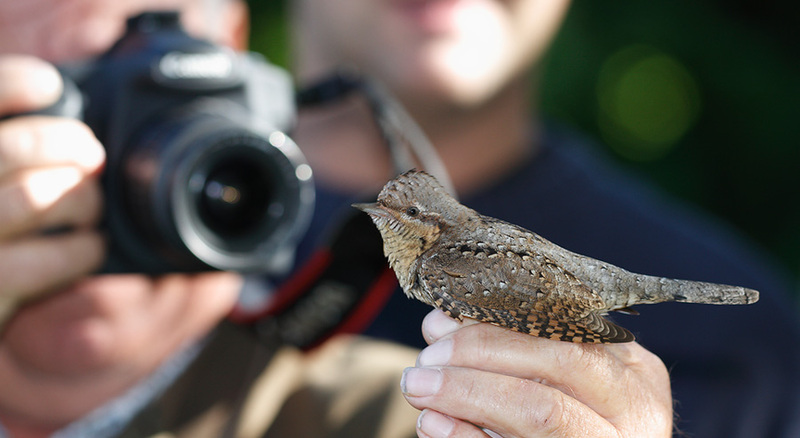 A welcome phone call this morning from CVRS, with news of a Wryneck in the bag. Only the fourth record of a bird which very few people have seen at Chew. It was watched for a few minutes after release, but wasn't seen subsequently. The male Lesser Scaup was still in Villice Bay, with other reports of a female Scaup-type hybrid (Stratford Bay), three Pintail, two Common Sandpipers and one Egyptian Goose. Big thanks to Mike Bailey and the chaps at the ringing station for phoning out the news. There's another photo here. The male Lesser Scaup was still in Villice Bay; Heron's Green Pool area held four Green Sandpipers and at least six Snipe. c.120 Swallows were counted flying south this morning, along with smaller numbers of Skylarks and Meadow Pipits. Still two Black Terns today, along with 600 House Martins, three Sand Martins, three Goldeneye and a Siskin. Four Black Terns were present today, and 24 Wigeon. At least 1000 House Martins at the lake today in continuous rain, corresponding with a heavy NE movement along the Avon coast today. A Little Gull was seen in Stratford Bay this morning, only to be replaced by a Black Tern this afternoon. The female Ferruginous Duck is still around; in Stratford Bay with ten Wigeon and a Goldeneye. A Pintail was at Herriott's Pool and the Egyptian Goose was at Picnic Site No.1. The male Lesser Scaup and male Ferruginous Duck were both still in Villice Bay this evening. The wildfowl count today produced a record total of 2473 Tufted Ducks and remarkably, the same figure of Coot. 293 Shoveler and five Siskins were also seen. A Red Underwing was on the stone hut at Herriott's Bridge. The male Lesser Scaup was seen from Bernard King hide this morning. In the Heron's Green area today were seven Green Sandpipers, six Snipe, four Little Egrets and a Hobby. The flash just south of Heron's Green Pool seems to be the best chance of seeing any waders at Chew this autumn: two juvenile Spotted Redshanks, two Redshanks, seven Green Sandpipers, seven Snipe and two Little Egrets. Two Spotted Redshanks were on Heron's Green Pool this evening. A surprise today was a flock of eight Sandwich Terns first thing this morning; normally they are only short-stayers at Chew and move straight through, but these hung around until early evening, when they were joined ten Common Terns. The female Ferruginous Duck was in the aythya flock in Stratford Bay, and the male Lesser Scaup was in Villice Bay. Three very vocal Hobbies were showing very well in Villice Bay, with a fourth bird at Stratford later. Also seen today were one Egyptian Goose, seven Green Sandpipers, seven Snipe, one Common Sandpiper, five Pintail and two Goldeneye. Of note CVRS reports a big fall in the number of Reed Warblers ringed this year; both as adults and nestlings. At the end of August, numbers were not much more than a third of the total ringed at the same time last year. Water Rails on the other hand have been the subject of a concerted effort this year with at least four nests found. Mike Bailey reports that Brown-veined and Twin-spotted Wainscots are extremely scarce this year; normally the feeding damage in the Phragmites is readily apparent at this time of year. It seems a combination of poor reed growth and the water level rising rapidly at just the wrong time this spring has decimated the populations. The Red-necked Grebe relocated to Heron's Green Bay today, where a female Ferruginous Duck was discovered. A summer plumage Red-necked Grebe was a nice find at Stratford hide today; this evening it flew down the lake towards the main dam. The male Lesser Scaup was still in Villice Bay this morning. The male Lesser Scaup was still in Villice Bay today, and the Black-necked Grebe was again viewable from Stratford hide, along with six Wigeon. Two Hobbies were feeding over Villice Bay this evening. The adult male Lesser Scaup was still in Villice Bay this morning and a Redstart was seen in the bushes along the old road on the Parkland. A male Ferruginous Duck x Tufted Duck was seen on the east side of Stratford Bay. A Black-necked Grebe was seen on the east side of Stratford Bay (by the main reedbed), and four returning Pintail were on Herriott's Pool. A Knot, Ringed Plover and a Hobby were seen at the main dam.